This plant deserves FAR more appreciation. 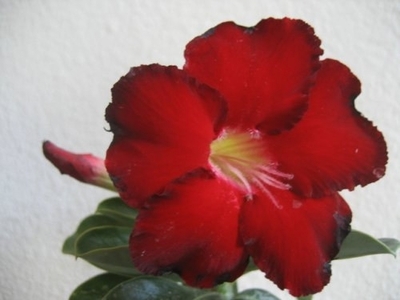 Desert Rose is excellent in pots especially for people who "kill everything" as the Adenium obesum lives with little care and can take a good deal of neglect. The coolest hybrids are produced in China, Taiwan and Thailand, and maybe India. Enjoy our personal desert rose collection. The plant will produces LARGE 7.0 cm flowers. Plant 5-7 inches tall that is well-rooted in a 4 inch pot similar to the one in the second photo. will ship without soil and pot. The diameter of this plant caudexes is about 4-6cm (sometimes it has multiple branches) .and should be planted soon upon arrival . Picture one shows what the flowers will look like when the plant blooms, The second one is a example of one of the plants that is sent. The pot will be different.